1727: he becomes disciple of the actor Ôtani Hiroji I in Ôsaka and follows him to Edo. 5th lunar month of 1732: tour in Nagoya; Hirohachi plays katakiyaku roles. 11th lunar month of 1733: Hirohachi goes back to Ôsaka and plays as a tachiyaku in the kaomise drama "Funa Zukuri Mannen Goyomi", produced at the Kita-Shinchi no Shibai by Kirinoya Tôkurô. 11th lunar month of 1735: Hirohachi goes to Kyôto, becomes katakiyaku and plays in the kaomise drama "Shin-yakata Banzei no Ishizue", which is produced by Arashi Koroku I. 12th lunar month of 1740: Hirohachi plays the roles of Kikuchi Jûrô and Katsura Ippeiji in the drama "Miura Danjô Sugata no Yoroi", which is produced by Nakamura Tomijûrô I in Ôsaka at the Ônishi no Shibai. 5th lunar month of 1747: his master Ôtani Hiroji I dies. 11th lunar month of 1748: Hirohachi plays the role of Matsuura Gorô in the kaomise drama "Mitsu Uroko Asahi no Ume", which is produced in Kyôto at the nadai Miyako Handayû's theater by the zamoto Somematsu Shichisaburô I. His stage partners are Fujioka Daikichi, Ichikawa Danzô III, Iwata Somematsu I, Yamanaka Heijûrô I and Mihogi Shichitarô. 1st lunar month of 1749: Hirohachi's rank in the Kyôto hyôbanki, katakiyaku section, is jô-jô-(shiro)kichi (superior - superior - (white) excellent). 11th lunar month of 1749: Hirohachi plays at Miyako Handayû's theater the role of Kawachi Kambei in the kaomise drama "Imosegura Kogane no Ishizue". His stage partners are Ichikawa Danzô III, Yamatoya Jinbê IV, Fujikawa Heikurô, Asao Motogorô I, Anegawa Daikichi I and Arashi San'emon IV. 11th lunar month of 1750: Hirohachi plays in the same theater the roles of Oni no Kurobê and Kajima Hyôgô in Matsuya Raisuke I's kaomise drama "Kaikei Wagô Hanayakata". 1st lunar month of 1751: first Kabuki adaptation of the puppet theater drama "Tamamo-no-Mae Asahi no Tamoto", which is produced in Kyôto by Miyako Handayû at his theater; Hirohachi plays the role of Agata Kenmotsu Genba [casting]. 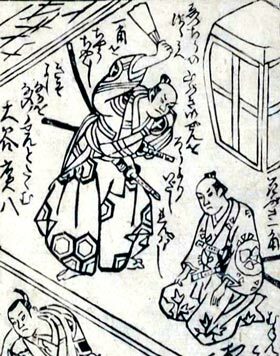 11th lunar month of 1751: Hirohachi plays the role of Gunta in the kaomise drama "En no Gyôja Ômine Zakura", which is produced in Kyôto at the nadai Hayagumo Chôdayû's theater by the zamoto Nakayama Bunshichi I. 11th lunar month of 1752: Hirohachi moves to Ôsaka and plays the role of Maeda Sadaemon in the kaomise drama "Kyô Miyage Matsuri Zoroe", which is produced at the Ônishi no Shibai by the zamoto Sanjô Sadasuke. His stage partners are Wakayama Shinkurô, Wakayama Bunshichi, Yamamoto Kyôshirô I, Iwata Somematsu I, Matsushima Kiyosaki, Ichimura Sanohachi, Kirishima Gizaemon, Kiriyama Monji I, Matsushima Moheiji, Takenaka Heikichi, Murayama Heijûrô IV and Nakamura Shirogorô III. 11th lunar month of 1753: Hirohachi plays in the same theater the role of Ecchû Jirobei in the kaomise drama "Taihei Kiso Monogatari". 11th lunar month of 1754: Hirohachi plays in the same theater in the kaomise drama "Uda Genji Asahi no Menbako", which is produced by Wakayama Bunshichi. His stage partners are Ichikawa Danzô III, Wakayama Shinkurô, Nakamura Utaemon I, Wakayama Bunshichi, Arashi Sangorô II, Yoshizawa Sakinosuke II, Anegawa Daikichi I and Someyama Sôjûrô. 1st lunar month of 1755: Hirohachi's rank in the Ôsaka hyôbanki, katakiyaku section, is jô-jô-kichi (superior - superior - excellent). 11th lunar month of 1756: Hirohachi plays the role of Kajiwara Heizô Kagetoki in the kaomise drama "Taihei Yamato Monogatari", which is produced by Anegawa Daikichi I in Ôsaka at the Kado no Shibai. 11th lunar month of 1757: Hirohachi plays the role of Taira no Tomomori in the kaomise drama "Sakiwake Musha Kôbai no Tazuna", which is produced by Anegawa Shinshirô II at the Naka no Shibai. 12th lunar month of 1759: Hirohachi plays the role of Daimonji Shibaemon in the kaomise drama "Bandai Fueki Hôrai Yakata", which is produced in Kyôto at the Kitagawa no Shibai by Arashi Hinasuke I. 1st lunar month of 1760: Hirohachi's rank in the Kyôto hyôbanki, katakiyaku section, is jô-jô-kichi (superior - superior - excellent). 11th lunar month of 1760: Hirohachi plays in Kyôto in the kaomise drama "Kiku Nagashi Kokka Taiheiki", which is produced by Nakamura Senzô and celebrates the shûmei of Nakamura Manbê. Fall 1761: the actors Ichikawa Danzô III, Nakamura Matsue I and Hirohachi go together to Edo to perform at the Moritaza. 11th lunar month of 1761: Hirohachi plays the roles of Gappô Tarô and Terukuni in the Moritaza kaomise drama "Misonô Banzei no Hachinoki". 1st lunar month of 1762: Hirohachi's rank in the Edo hyôbanki, katakiyaku section, is jô-jô-jû (superior - superior - "ten"), below his Kamigata rank. "jû" is in fact the first 2 strokes of the ideogram "kichi" and means "ten". Hirohachi plays in the same theater the role of Yawata no Saburô in the new year sogamono "Koi Zakura Umewaka Soga". 11th lunar month of 1763: Hirohachi is back in Kyôto and plays the role of Kurozuka Heima in the kaomise drama "Shôchikubai Ôshimadai". 1st lunar month of 1764: Hirohachi's ranking is back to the "superior - superior - excellent" level in the Kyôto hyôbanki. 11th lunar month of 1764 ~ 1770: Hirohachi's name does not appear anymore in licensed theaters banzuke. Spring 1771: Hirohachi plays in Ôsaka at the Horie Ichinogawa Shibai. This performance is likely to be his final stage appearance. Ôtani Hirohachi I was a talented old-fashioned katakiyaku, who spent almost all his career in the Kamigata theaters but unfortunately did not achieve the fame he deserved.